1+ miles inland: 35-40% Fall Colors 60-65% Summer Colors. 10-20% Fall Colors along Lake Superior. 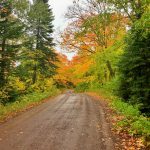 Fall is officially here and it made a dramatic entrance with gale winds blowing in over Lake Superior and some rain this past weekend. 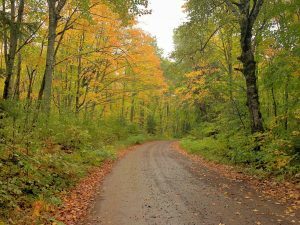 Even on a cool rainy day, you can enjoy the fall colors with one of the many Fall Color Drives right here in Cook County. That is just what we decided to do on Sunday as we headed out to travel along the Honeymoon Trail Loop from the comfort of our car. Access to the Honeymoon Trail for Bluefin Bay Family of Resorts guests is easy as it starts just across from Coho Café & Bakery on the Sawbill Trail (the perfect opportunity to grab a coffee and some bakery goods or a sandwich to-go!). 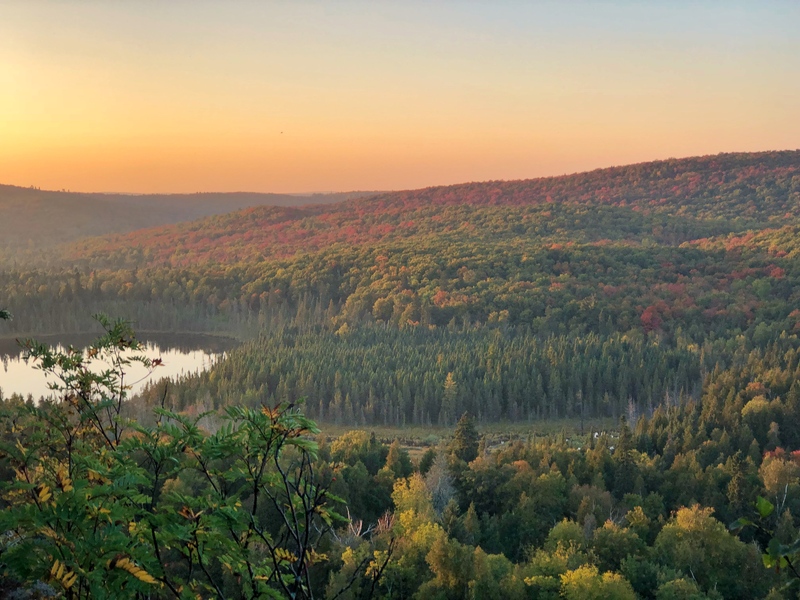 Your travels will take you 10 miles inland along the paved Sawbill Trail with one not to miss overlook just a few miles up – grab your camera for this stunning fall color display. 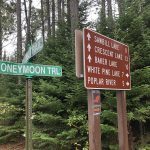 Just before the pavement ends, the Honeymoon Trail road will be on your right. This is a well-traveled gravel road but slower speeds are necessary as you watch out for wildlife, fallen branches, and mountain bikers. We’re reporting quite a bit of green along this drive but the aspen and birch are definitely showing beautiful shades of golden yellows. A few orange and red maples dotted the landscape but peek color is yet to come for those trees in a week or two. This trip is made even sweeter with stops at the local maple syrup providers along the way. 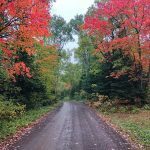 Wild Country Maple Syrup is located off the Honeymoon Trail and Caribou Cream is on the Caribou Trail as you head back down toward Hwy 61 on the last part of this fall color drive. Yum! For more information, maps and local tips on this and other fall color tours stop by the front desk during your stay. 1+ miles inland: 15-20% Fall Colors 80-85% Summer Colors. We are still reporting little to no color change along Lake Superior with only 0-5% Fall Colors. 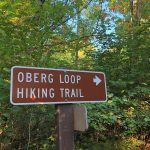 A favorite hike of guests and resort staff is the nearby Oberg Mountain Loop hike. This gorgeous trail travels in a loop atop the mountain and follows the ridgeline offering panoramic views from several overlooks of Lake Superior, Oberg Lake, and The Sawtooth Mountains. 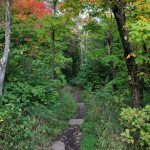 These spectacular overlooks make it a favorite fall color tour hike and at only 2.75 miles you can easily fit it into a day filled with other adventures. 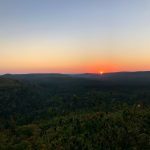 If you want to add even more of a wow factor to this hike we suggest heading up about an hour before sunset so you can catch the sun setting from one of the western overlooks. This is exactly what we did yesterday and it did not disappoint. There is something extra special about viewing a sunrise or sunset from atop a mountain! 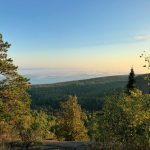 As we drove the 1+ miles up to the parking area at the base of Oberg Mountain we traveled through a mostly green forest. 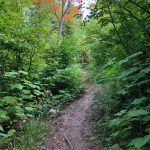 Once on the trail, the first quarter mile was also predominately green and lush but heading farther up we started spotting some bright orange maple trees dotting the landscape. 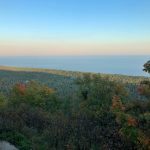 On the south side of the mountain that overlooks Lake Superior, there is very little color change with just a few trees that decided to turn early. 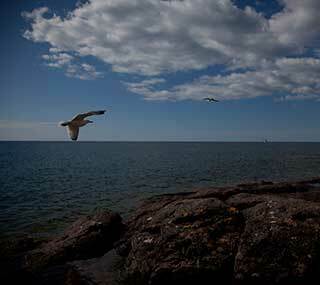 Stops at the overlooks that face farther inland showed a whole different landscape. Green trees were spotted directly below with the view slowly changing to beautiful shades of orange looking farther inland. The setting sun really turned up the volume on the already vibrant orange colors! After you complete the loop atop the mountain we recommend one more stop at the west facing overlook to watch the sunset. You won’t regret it and you’ll have just enough time to hike back down to the parking area before dark sets in. 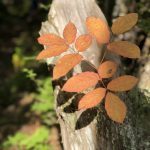 In addition to the beautiful fall colors that are just beginning to make an appearance, it is almost time to celebrate the incredible artists along Minnesota’s North Shore. The Art Along the Lake Fall Studio Tour begins September 28th and runs through October 7th. 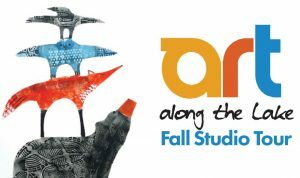 Over 20 local artists and galleries will offer experiences like views into their studios, demonstrations, special art exhibits, and hands-on activities. Click here for a brochure complete with a map and artist listings. 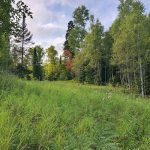 Visit Minnesota DNR’s Fall Color Finder map to stay up to date with the color change in Minnesota! Also, Here at Bluefin Bay Family of Resorts, we will be providing a weekly Fall Color Report. Look for it in our blog and social media every Monday through mid-October! 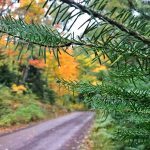 Fall Color Report: Fall Fun at Lutsen Mountains! 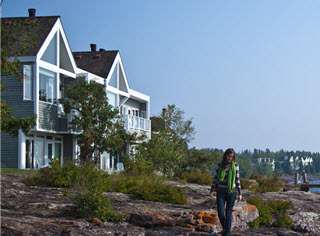 Bluefin Bay Family of Resorts Fall Color Report: 90% Summer Colors and 10% Fall Colors. We are reporting little to no color change by Lake Superior with a bit more fall colors peeking through 1-2 miles inland. It’s still mostly green out there! 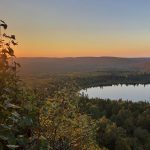 A fall color tour to Minnesota’s North Shore isn’t complete without a trip up to Lutsen Mountains. 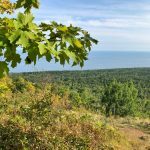 It’s less than a 10-minute drive from the shores of Lake Superior at Bluefin Bay Family of Resorts and offers fun for the whole family. The Summit Express Gondola is one of our favorite ways to view the fall colors. 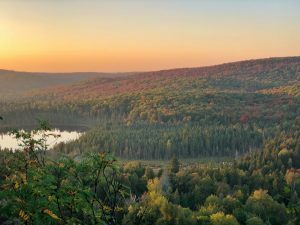 You’ll travel above the treetops heading up 1,000 feet to the top of Moose Mountain with views of the autumn colors, Lake Superior and the Sawtooth Mountains. Hop out at the Summit Chalet for even more breathtaking views, scenic overlooks, and hiking trails. 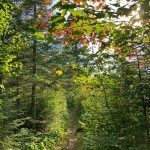 For those looking to add a long hike to their Lutsen Mountains experience, we recommend heading out on the Superior Hiking Trail starting from the end of the road that runs past the main ski area. 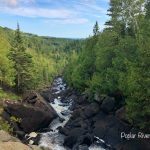 This 4.5-mile hike winds across the Poplar River and around the back of Mystery and Moose Mountain through forests of cedar, brightly colored maple and aspen. 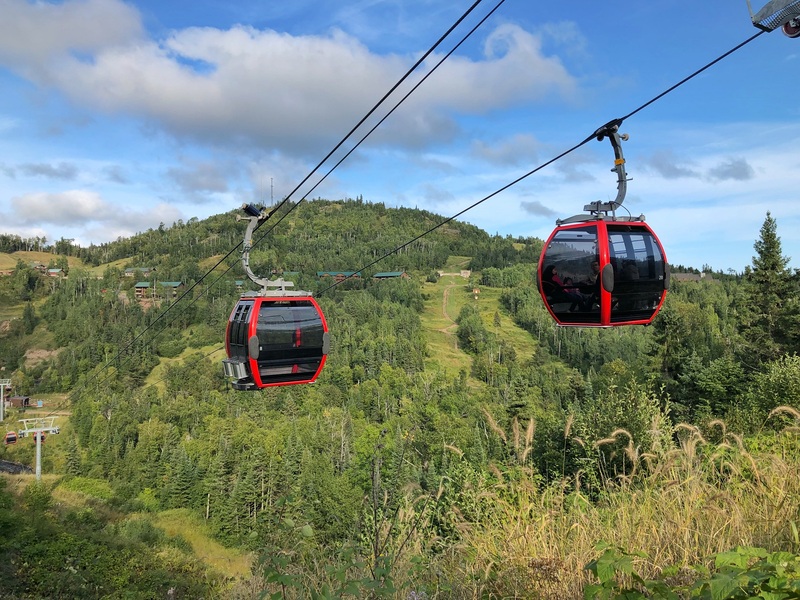 The hike ends at the top of Moose Mountain where you can purchase a ticket and head back via the gondola – a sweet way to end a rewarding hiking adventure! The Summit Express Gondola is open daily through October 21. The Alpine Slide is perfect for those looking for a few thrills during their fall color tour. One of the best parts of this activity is the chairlift ride to the top of Eagle Mountain providing a unique view of the fall beauty. Your trip down can be fast and thrilling or slow and easy as you zip down a half-mile track on your sled. This one is a family favorite! The Alpine Slide is open weekends through October 21. Labor Day 2018 has come and gone and it’s now time to think FALL! 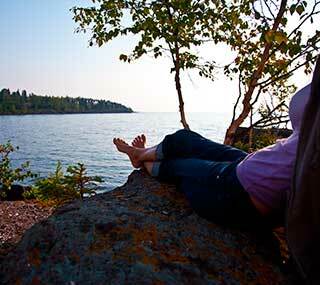 Changing leaves, crisp mornings, sunny afternoons, and abundant outdoor recreation activities. Yes, please! Here on the North Shore we typically see peak fall colors between mid-September and early October. 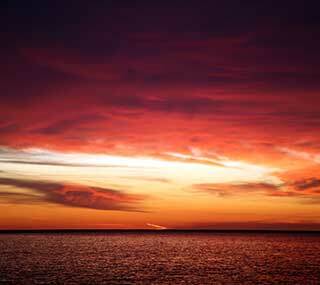 Because of the powerful Lake Superior, we are fortunate to experience longer color than the rest of Minnesota. The first color change starts inland and gradually moves toward the Lake Superior shoreline where the last of the trees turn for the season. For almost a month, you can enjoy many different spectacular color drives or hikes depending on when you visit. 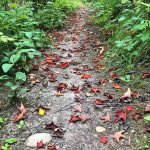 Each week, starting today, we’ll report on a different activity that is perfect for viewing the fall colors plus an update on the fall color change. Look for it every Monday morning until Mid-October. 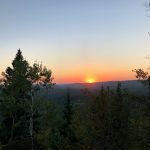 Yesterday we drove to the top of the Onion River Road and headed out on one of our favorite guided resort hikes: The Leveaux Mountain Loop. 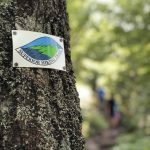 This hike takes off from the same trailhead parking lot as the popular Oberg Mountain Loop. 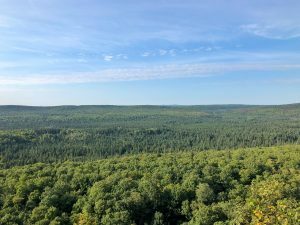 Don’t miss the less-traveled Leveaux hike where you’ll experience an almost magical feel as you hike through old growth cedar and red pine forests mixed in with maple and birch. 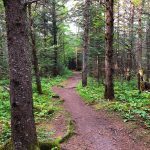 For this hike, you’ll be on the main Superior Hiking Trail for part of it as well as the spur trail that leads to the overlook loops. The total hike is just over 3 miles and considered moderate in difficulty. A few switchbacks and short climbs are a bit steep but these are complemented by two gently rolling terrain loops at the top that provide incredible overlooks in all directions. 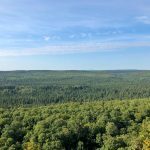 Up here you’ll have a view of Carlton Peak, Britton Peak, Taconite Harbor, and Lake Superior on one side and a distant view of the Lutsen Mountain Ski Hills, lush inland forests, and the rest of the Sawtooth Mountain Range on the other. We are reporting only a slight change in color and still 95% summer green colors on the trees. There were a few trees that decided to turn some of their leaves early which did get us excited for the colors to come. For now, summer is still here!